Amy was the first saxophonist to win major competitions including the Gold Medal at the Royal Overseas League, the Symphony Australia Young Performer of the Year, the Bromsgrove International Young Soloists Competition and the Eastbourne Young Musicians’ Competition. 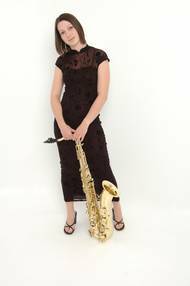 Amy has also won the wind section of the Tunbridge Wells Young Concert Artists competition and was named Young Performer of the Year by the British Clarinet and Saxophone Society in 2000. Amy has won numerous Eisteddfod prizes in Australia, and has also been a recipient of the James Fairfax Young Artist of the Year Prize. Solo appearances include performances of the Larsson, Glazounov, Dubois and Binge concertos with the Sydney and Adelaide Symphony Orchestras, the Ku-Ring-Gai Philharmonic Orchestra and the Eastbourne Symphony Orchestra. Amy has made many recordings for major international radio. She has been featured on television programmes, documentaries and recently performed for the 2005 Commonwealth Heads of Government Meeting. 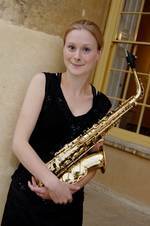 Amy has a particular interest in contemporary music, and works closely with composers on new works for saxophone. She has premiered and recorded many new works by composers including Graham Fitkin and Michael Csanyi-Wills. Naomi studied at Chetham's School of Music, Royal College of Music and Northwestern University, Chicago. Her teachers have included Kyle Horch and Frederick Hemke. She has won awards from the Musicians Benevolent Fund, Countess of Munster and at competitions including the Royal Over-Seas League, Pacem in Terris Bayreuth: Germany, the Northshore Music Competition: Chicago, and from the Royal College of Music and Northwestern University. As a soloist Naomi has performed with orchestras in USA, Germany and UK. She is continuing to work on the Countess of Munster Recital Scheme and for Live Music Now! Her orchestral playing includes work with the Bournemouth Symphony Orchestra, the Hallé Orchestra and Birmingham Contemporary Music Group. As a chamber musician, Naomi has performed at numerous London venues as well as for the Park Lane Group Young Artists Series and Blackheath Hall’s Young Artists Series. To date, she has recorded four chamber music CDs on various labels with Paragon Saxophone Quartet, counter tenor: Larry Zazzo and contemporary music group: Avenue A.
Naomi currently teaches saxophone at the Purcell School. Hayley studied at the Colchester Institute with Angela Fussell before going on to the Royal College of Music, where she studied with Kyle Horch and Martin Robertson. Now a busy freelance player, Hayley has broadcast new music by the British Composer Ian Stewart, live on Resonance FM and has recently performed with the New London Sinfonia, the Royal Ballet Sinfonia, the Royal Philharmonic Orchestra, the City of Birmingham Symphony Orchestra and the Royal Scottish National Orchestra. Visit Hayley's own site - it will open in a new window. Toby graduated from the Guildhall School of Music & Drama in 2000. He has played with the London Sinfonietta, Philharmonia, Britten Sinfonia, Icebreaker and European Union Youth Orchestra. He has featured on the soundtracks of major films, and BBC and ITV television series. He enjoys performing as a soloist, with contemporary music ensembles and as a chamber musician. Toby has performed with many theatre and music theatre companies, playing on several productions at the National Theatre, the West Yorkshire Playhouse and at the Almeida. 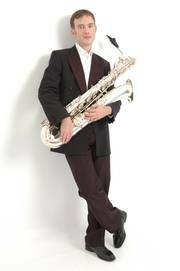 As the solo saxophonist in Riverdance, he has performed in Dublin and on tour in the USA, Europe and Asia. Toby is passionate about new music and loves working with composers and creating new repertoire for the saxophone.